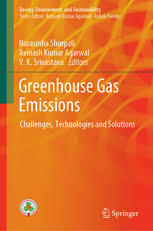 Greenhouse Gas Emissions research papers examine the the major cause of the potentially devastating effects of climate change that are transforming the Earth. Greenhouse gas emissions are largely responsible for the potentially devastating effects of climate change that are transforming the Earth. Greenhouse gases, largely carbon dioxide, but also including methane, nitrous oxide, water vapor and ozone, are released when burning fossil fuels. With the advent of Industrialism, human beings began to burn coal and oil and deforest large segments of the planet in a never-ending quest for more energy. As a result, there has been a 40 percent increase in the levels of greenhouse gases in the atmosphere since 1750. Greenhouse gas emission are responsible for producing the greenhouse effect, which is currently raising the temperature of the Earth, a reducing the size of the polar ice caps, raising ocean levels, and causing widespread disruption in weather patterns. Greenhouse gases, such as carbon dioxide or ozone, prevent significant portions of solar radiation from returning to outer space, trapping them in the atmosphere. Carbon dioxide is the main culprit of greenhouse gas emissions in the atmosphere. Scientists have been able to measure concentrations of carbon dioxide as having increased from 313 parts per million in 1960 to 389 parts per million in 2010. This current level exceeds historical levels from the Earth’s past as measured in ice core samples. Before the Industrial Revolution, carbon dioxide was only 270 parts per million. Paper Masters writes custom research papers on Greenhouse Gas Emissions and examine the the major cause of the potentially devastating effects of climate change that are transforming the Earth.